Reunert’s 2017 results reflect a 14% growth in operating profit and a 19% growth in profit for the year. 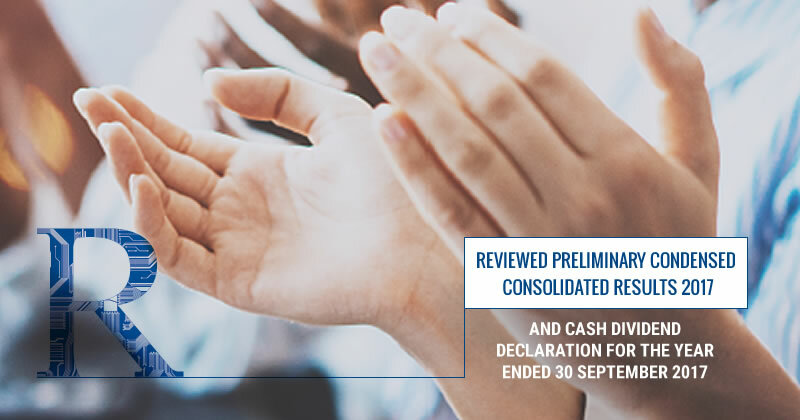 This improvement in profitability flowed through to headline earnings per share which also grew by 19%. This was achieved, as highlighted in our previous prospects statements, through a strong second half performance across all segments, including the export businesses. The execution of the group strategy led to three further acquisitions in the year and a continued focus on customer service and operational efficiencies. Reunert manages a diversified portfolio of businesses in the fields of electrical engineering, information communication technologies (ICT), and applied electronics. The group was established in 1888, by Theodore Reunert and Otto Lenz, and has contributed to the South African economy in numerous ways over the past 129 years. Reunert was listed on the JSE in 1948 and is included in the industrial goods and services (electronic and electrical equipment) sector of the JSE. The group operates mainly in South Africa with minor operations in Australia, Lesotho, Sweden, the USA, Zambia and Zimbabwe. Reunert’s offices are located in Woodmead, Johannesburg, South Africa.